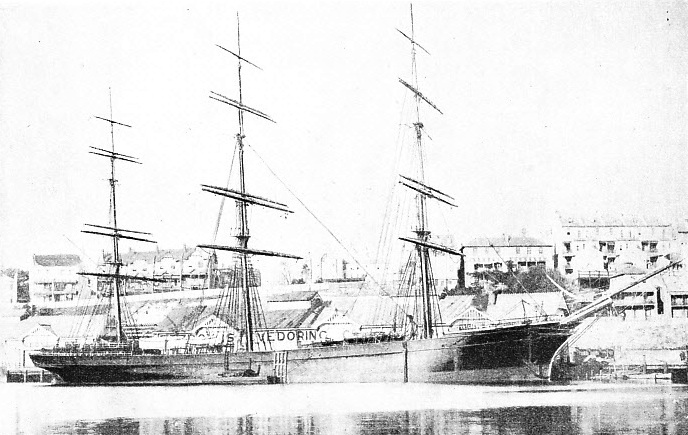 BUILT AT ABERDEEN IN 1877, the clipper Brilliant on dimensions 254 ft 8 in by 39 ft 7 in by 24 ft 2 in had a gross tonnage of 1,668. Her appearance lived up to her name, for she had a highly-polished brass rail that ran round the ship and polished teak with beautiful filigree fretwork in the panels inside the bulwarks. SAIL remained at a high standard on the Australian trade long after the clipper ships had been forced off the other routes by the advance of steam. Fine-lined sailing vessels of at least semi-clipper standard, capable of making magnificent passages, were built for the Australian trade as recently as the early ’nineties, but in the history of that trade there was no rivalry more interesting than the long one between the Pericles and the Brilliant. It was a rivalry comparable to that between the Thermopylae and the Cutty Sark, but where those two redoubtable champions had only one opportunity of meeting in a straight race, the Pericles and the Brilliant raced out and home again year after year, and their fortunes were followed by innumerable enthusiasts both in Britain and Australia. These ships were built in the same year by rival yards in Aberdeen, the town where the original clippers were built for the coasting trade. The Pericles was built by Hood for George Thompson’s Aberdeen Line, and the Brilliant was built in the neighbouring yard of J. Duthie Sons & Co. to run on their own service. They were constructed side by side in 1877, both iron full-rigged ships, and both very similar in their outward details. The Pericles had a length of 259 ft 6 in, a beam of 39 ft 4 in and a depth of hold of 23 ft 6 in, giving her a gross tonnage of 1,671; the Brilliant, on dimensions 254 ft 8 in by 39 ft 7 in by 24 ft 2 in, had a gross tonnage of 1,668. The Pericles was given one of the classical names, which had been the rule with the Aberdeen Line’s sailing ships for many years, and which was retained for their steamers as long as they were independent. Pronunciation was a sad trial for the shellback of the old type, who in this instance preferred Per-I-kuls (with the accent on the second syllable), and who poured scorn on the young-ster getting in sea time for his ticket in the forecastle, as many of them did, who gave the name its orthodox quantities. Duthie & Co. generally preferred the names of the many members of the family who were shareholders, but there were many other ships named without any particular system, and the fame of their previous Brilliant was still remembered. THE PERICLES WAS ALSO BUILT AT ABERDEEN, but by a rival firm. Like the Brilliant she was an iron, full-rigged ship, but had a length of 259 ft 6 in, a beam of 39 ft 4 in, and a depth of hold of 23 ft 6 in, giving her a gross tonnage of 1,671. 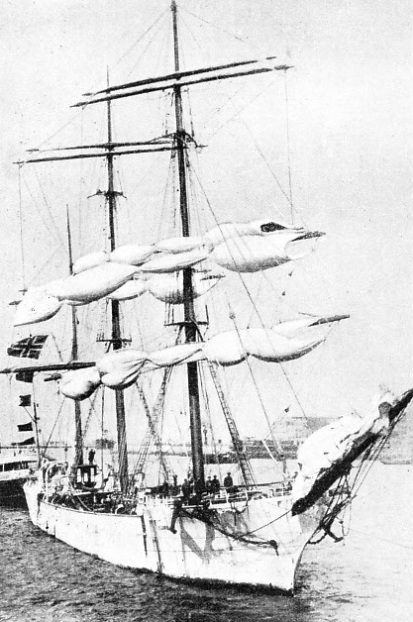 The Pericles had a white-painted half-round poop 56 feet long, for the accommodation of her passengers, extending well forward of her mizen-mast, and a forecastle 35 feet long for housing a large crew. Both bore the unmistakable stamp of the Aberdeen designers, the Pericles having a white-painted half-round poop 56 feet long for the accommodation of her passengers, extending well forward of the mizen-mast, and her forecastle was 35 feet long for housing a large crew. The Brilliant had what was known as the “modified Aberdeen poop” with a large house; her owners would not have white paint, but believed in polished teak with a lot of beautiful filigree fretwork in the panels inside the bulwarks. Keeping this work clean called for much labour, as did the brass rail that ran round the ship. The rail was always kept brilliantly polished, a job done by the seamen and not by the apprentices. The Brilliant was a great favourite with the wool shippers at Sydney, especially Danger Geddye & Co; in the Thames she was always loaded by Houlders. 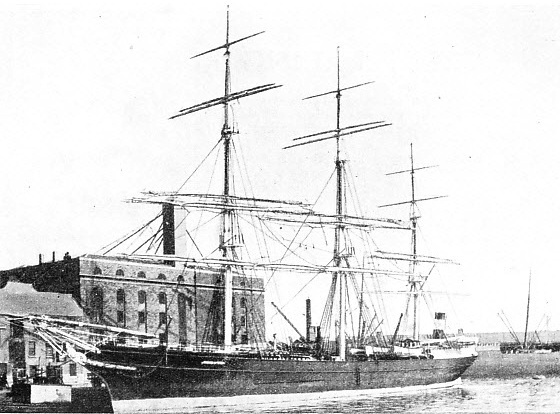 The Pericles also appealed to the wool shippers, but outward bound her business was largely with passengers, for whose convenience she was fitted with a large donkey boiler that not only condensed water for their use on the passage (to supply water was always a considerable difficulty in the emigrant carrier) but also supplied power to the windlass and eased the working of the ship. The Pericles was the more comfortable ship for her people, for although the Brilliant was a good all-rounder and capable of a very high speed, she was a particularly dirty ship when before the wind and was liable to take heavy water over the stem. She would sail very close to the wind, but there again she was very wet, and on more than one occasion the sea cleared almost everything off her deck. In spite of it all, however, she did not have the unenviable reputation as a man-killer that so many wet ships had. Second in importance to the design of a ship and her construction is the choice of a captain, and in that both owners were lucky. Captain J. Largie was engaged for Pericles, and Captain C. W. Davidson for the Brilliant, both men with fine reputations on the Australian clipper trade. Largie was born at Montrose in 1834 and went to sea as boy at the age of fifteen in one of the little vessels that then sailed out of the port. He rose finally to seaman in 1853.
importance, his ambition increasing as he proved his ability. In 1863 he got his extra master’s ticket, the highest to which he could aspire. Captain Charles William Davidson of the Brilliant had an easier time in his youth. Born in Edinburgh in 1847, he served his apprenticeship in the Aberdeen sailing vessel Liberator, and having completed his time when the ship was on a voyage, was rated boatswain for the rest of it. He got his second mate’s ticket in 1868, as soon as he was qualified to sit and, after a voyage as third mate, returned to the old Liberator as second and then first mate, serving in the same capacity in the John Duthie until he got his master’s certificate in 1874. Although radically different, the two captains were the greatest of friends. Davidson was a very big man, weighing twenty stone in his later days, and was of jolly temperament. Largie was very much more sedate, but popular with the people who troubled to know him. On account of his reserve there seems at first to have been some doubt in the minds of the owners as to whether he was quite suitable to command their crack passenger vessel, but the matter was settled in his favour on the ground that most of her passengers were emigrants and that his manner would be of help in maintaining discipline among them. In practice his genuine qualities, recognized in the course of a long voyage, gathered round his ship a very valuable little circle of saloon passengers who travelled in her regularly. The Pericles was the first away. She left London on September 10, 1877, and arrived at Sydney on December 7. The Brilliant left London on September 28, passing Start Point on October 2, and arrived at Sydney on December 21. Beginning similar voyages so closely, the captains naturally made the bet of the traditional hat on the result of their journeys. The first run was to prove of enormous interest. The Brilliant did her passage in eighty-four days against the eighty-eight of the Pericles. That encouraged the captains to make a regular feature of the new hat, often an expensive one. The bets which the crowds in the two forecastles put up were sometimes more than rash. A month’s pay was a common stake among the seamen. THE BRILLIANT WAS A GOOD ALL-ROUNDER and capable of very high speeds, but she was a dirty ship when before the wind and liable to take heavy water over the stern. She would sail very close to the wind, but there again she was very wet and on several occasions the sea cleared almost everything off her deck. She did not, however, have the unenviable reputation of a man-killer possessed by so many wet ships. The initial victory of the Brilliant was particularly noteworthy, as she was loaded down with general cargo, while the Pericles, carrying 494 State-aided emigrants, could trim herself to much better advantage. Homeward bound, leaving Sydney in February, 1878, the Brilliant had it all her own way, for her passage was eighty-eight days while the Pericles took 101. In judging the outward passage, it must be remembered that the Thompson ship lost some time in Plymouth over her passengers. On the homeward run of 1878 Captain Davidson lost another bet, for Captain George Mathias of the Duchess of Argyle was quite sure that his ship could beat the Brilliant, and she did. Captain Mathias went to the Paris Exhibition with Davidson at the latter’s expense and Captain Largie’s hat did not go far towards squaring the account. The rivals got away within a few days of one another in August, 1878, but they were level at the Lizard, and the Pericles reached Sydney with rather more than twenty-four hours to spare. But the Pericles made a wonderful run home, doing it in eighty days against her rival’s ninety-nine. So the racing went on year after year with very little interruption, the Pericles generally getting the better of the outward contest and the Brilliant homeward. Sometimes they failed to meet; in 1879 the Pericles came home via Calcutta, and in the following year the Brilliant had a cargo from Port Pirie to Havre. In 1882, 1883 and 1884 the Pericles again came home via India, and in 1882 the Brilliant did an intermediate run from Newcastle, NSW, to New Zealand and then home; but even when there was no chance of a direct contest the ships were always sailed hard and kept in fine condition. So beautifully was the Brilliant maintained, with her brass rail and her polished black sides, that in the London River she was always referred to as the “Australian Yacht”, and in Australian waters as “Duthie’s Yacht”. As the years passed it became more and more difficult to get the regular homeward cargo of wool, and both ships were frequently diverted to various ports - Calcutta, San Francisco, Bombay or Madras - and were employed carrying any cargo that could afford their price. These diversions from the ordinary Australian run naturally spoiled the racing interest, about which Australians were particularly enthusiastic, but they were of great help to the apprentices, of whom large numbers served their time in one or other ships. In the opinion of many Board of Trade examiners there was too much sameness about the regular Australian trade, and too much help from tugs, so that the examiners were particularly hard on candidates who had served their apprenticeship on it. Lads whose ships had visited many ports, some with very poor equipment, were given credit for having picked up a good deal more miscellaneous knowledge. That was a factor which could count for a good deal in a youngster’s chances; if miscellaneous experience could be obtained with the superior conditions of the better class Australian traders he was lucky indeed. Outward bound in 1887, the Brilliant was dismasted in latitude 41° S, and had to be jury rigged, although this was done so well, and she was such a magnificent little ship, that she made a day’s run of 270 miles in that condition. Captain Davidson was given a silver tea service by his admirers when he arrived at Sydney, but the ship’s damage cost the underwriters about £3,000 to put right. In 1888 she made her best homeward passage of seventy-nine days, and it was the turn of the Pericles to have bad luck. Captain Largie suffered so severely from eye trouble that he had to return home by mail steamer. He was replaced by Captain William Philip, of the Salamis, who had commanded that ship for thirteen years and who had arrived at Melbourne with his son as his first mate. Captain Philip was ordered to hand over the command to his son, and to take over the Pericles. He was then fifty-four years of age, Aberdeen born and bred, and had served most of his life in Aberdeen ships. The only exception was the Spirit of the Age of London, in which he spent fifteen months during the Crimean War. He had been in such ships as the Maid of Judah and Phoenician, and Thompson’s knew him well and trusted him absolutely. He did equally well in command of the Pericles, but homeward bound he generally had to look to the Pacific coast-for a grain cargo. In 1889 he sailed against the Titania, a ship that beat him by two days on a longer course, and outward in the following year his times did not coincide with those of the Brilliant. He raced against the steel ship Ardencaple, that left the London River on the same day, and was beaten by twenty-four hours. In the severe winter of 1894-5 the Brilliant loaded specially for the January wool sales, and just managed to catch them by engaging two tugs from Land’s End. There was a heavy bill to pay, but it was worth while. That was in the heyday of the tug’s seeking business, for sailing ships could not compete with steamers if they were to waste many days beating up Channel against a head wind. The two captains bargained about price and the tug was not engaged until it was absolutely necessary; two tugs all the way from Land’s End was an event to be discussed by tugmen for years afterwards. During the ’nineties the rivals were again more frequently on the direct Sydney trade, and the racing was resumed with all the old enthusiasm. In 1895 Captain Davidson felt he had had enough and retired from the command of the Brilliant, settling down at Sydney as Marine Superintendent for Messrs. W. G. Deuchar & Co, the shipping agents. He was a wonderful old gentleman and was in harness until well after the war, dying in 1926 at the age of eighty. He was succeeded in the command by Captain Thomas Charles Carlton, a Londoner; in those days it was unusual for a London man to be appointed to the command of an Aberdeen ship. Captain Carlton was then forty-nine and had had a varied experience in many ships. 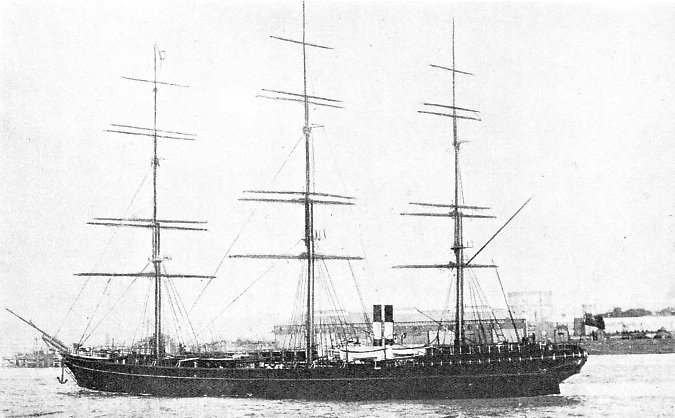 THE PERICLES WAS SOLD TO NORWEGIAN OWNERS in 1904 and used on the timber trade. After that she was sold and re-sold several times, and during the war of 1914-1918 made large fortunes for her various owners. During those years she was able to find freights outside the danger zones, and was also fortunate enough to escape attention from enemy craft. In 1869 he had gone out to Bangkok as first mate of the trading ship Lotus, but when he got there he made such an impression on the Siamese that he remained for over four years as an officer of their navy, assisting materially in its development before returning to trade again. His second visit to Sydney in command of the Brilliant is still talked about in sailing ship circles. One morning, when she was about to sail, people on the water-front were astonished to see the three brass balls of a famous Sydney pawnbroker decorating the end of her boom. There was, of course, great excitement and the police detained the Brilliant for twenty-four hours while they made inquiries, but by that time the ship whose apprentices had played the prank was well out to sea. The command of the Pericles passed in 1899 to Captain John G. Holmes, a Cumberland man who had served all his early time in the famous Holme ships of Maryport. He kept her for only a year and then gave place to Captain John Henderson, one of the real hard-case Peterhead sailormen, who was born in 1836 and had his first command in Thompson’s fleet at the age of thirty. His commands had included the famous Thermopylae, and he made the Pericles walk in her old style during the four years he retained command. The Brilliant also had her changes, Captain C. Cowlishaw taking her over in 1901 and being relieved by Captain C. Morrison in 1904. That was a fatal year for both of them, for the Pericles was sold to Leif Gundersen, of Porsgrund, and hoisted the Norwegian flag for the timber trade, the yards being removed from her mizen to economize in men. Within a very short time the Brilliant was sold to Tomaso Gazzolo, of Nervi, and hoisted the Italian flag as the Nostra Signora del Carmine. She also was cut down to a barque, but was lucky enough to find owners who were intensely proud of her and maintained her well. The Pericles was sold and resold several times. During the war of 1914-18, she made big fortunes for her various owners. The Brilliant was not so lucky; on August 25, 1916, when bound from Baltimore to Genoa, she was intercepted by an enemy submarine off Cape Creux. The boats containing her crew were towed toward land and the grand old ship was then sunk by thirty shells. Having survived the war, the Pericles, under the name Sjurso, was finally broken up at Kiel, at the end of August, 1923.